There is a lot similarity between digital branding and filmmaking. They both have a story to tell for the audience to engage with the brand or film among many competing options. Filmmakers probably have it harder. They rarely get a second chance. Movies have a short window of time to make it or fizzle out. In fact, the film industry in general can forecast in the first opening week the total gross revenue for the year. As a result, Movies need to be relevant, unique, credible and interesting to be successful. This sounds a lot like branding. Keeping with this analogy, let’s say that you want to assess your brand storytelling. 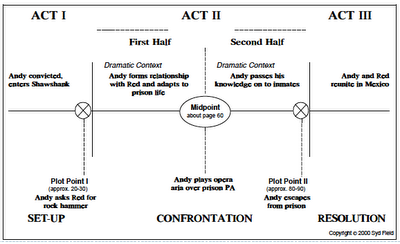 Documentary filmmakers think of the story in a three-act structure, similar to playwrites. The hero’s journey has three acts to follow: problem (set up), confrontation and resolution. To best tell the story, filmmakers tend to focus on the key scenes when the main character is confronted with the story’s central conflict. A good example is the Shawshank Redemption (see image). The Story: A young banker, convicted of murdering his wife andher lover, is sentenced to Shawshank Penitentiary. In prison, Andy meets and forms a relationship with Red, another convicted killer, then becomes an ally and trustee of the warden. When his attempts for a retrial fail, he escapes Shawshank. At the end, Andy makes his way to Mexico, where he and Red are reunited. A good brand story should follow the same principles. I think Chrysler’s Eminem “Imported from Detroit” anthem commercial is a great example. The set-up:, a motor city wrecked by the economy and poor management. “How does this city know about luxury?”. In summary, Chrysler does a good job not only in structure, but also in striking an emotional cord and connecting with the audience. Chrysler video turns consumers into advocates. They make the audience feel part of the journey. Brands should continue to emulate filmmakers in the art of storytelling. If the brand story is credible, relevant, interesting and unique, brands will captive audiences, generate buzz and drive revenue.